Make a point to do a lap around the office at least once (or twice — in case you missed anyone the first time) for brief face-to-face check-ins with your colleagues, especially your direct team members. 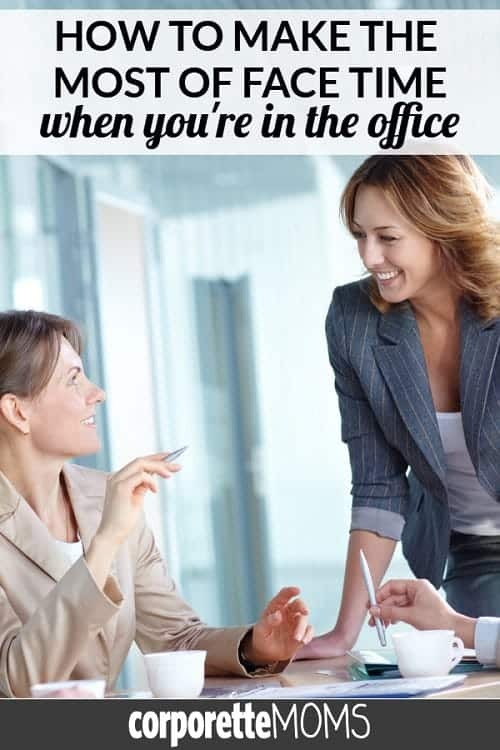 You obviously don’t want to interrupt their work too much, or make it look like the only reason you’re chatting with them is to show that you’re in the office that day, but it’s a good idea to take a few minutes to ask genuine questions and listen to any concerns. You can ask your coworkers about their weekend, if they have any vacations coming up or if they just returned from a vacation since you were last in the office, or follow up on anything you talked about the last time you saw them, whether it’s a big or a small deal. This is also a good opportunity to check in and see if there’s anything you can do to help with work projects, or see how their work projects are going. If you recently heard about a coworker’s big news — new baby, new house, new pet, new promotion, new client, or even if they just had or are about to have a birthday on one of your remote days — make the time to wish them well in person. You might also consider bringing them a small gift or card (whatever you would do if you saw them on a more frequent basis). If you’re out of the loop, try to ask around to figure out if there’s anything major you are missing. You might also check with whoever handles the birthday cards to see if any are currently in that “secret folder” for you to sign. Whether you bring or buy your lunch on days you’re in the office, try not to eat alone at your desk or run errands on your lunch break. Instead, invite a coworker or two to join you in the office cafeteria, local lunch spot, or in the conference room to catch up, preferably on anything that’s not work related so it still feels like a break. If you have a lunch meeting or need to eat at your desk, consider inviting coworkers for a coffee break or brisk walk during work hours (whatever you would do if you were normally at the office). If you have a meeting scheduled for a day when you’re at the office, prepare as much as possible before you come into the office so you aren’t scrambling at the last minute, and so that you’ll have more time to talk face-to-face with your team members before the meeting. This is especially useful if the meeting will be with a client or another external party that will require you to prep with your coworkers ahead of time. Not only will you look better for already being organized, you’ll be able to help with any last-minute requests from your coworkers. Hopefully they’ll remember and appreciate your efforts if you ever need their help whether you’re in or out of the office. While you might normally rush back to your desk right after a meeting, if coworkers are sticking around the conference room, stay with them for a bit if you don’t have to get back to your workspace right away. Don’t waste their time or yours, of course, but you’ll be able to make up a few minutes away from your computer. While it’s easier to just share concerns in an impersonal email or chat, it’s always better, and more professional, to have difficult conversations in person. If you need to express a grievance with a coworker, try to wait to do it on an in-office day instead of remotely. Otherwise, you’re more likely to have hurt feelings and potential for resentment, when an in-person conversation may have quickly resolved the issue without several emails that could ultimately be misinterpreted. If your schedule allows and your coworkers are going to happy hour after work, try to tag along for at least the first round. Similar to getting lunch or coffee, it’ll give you a chance to have more facetime with your coworkers in a more casual setting. If you do get an invite and can’t stay any later than the end of that workday, offer a raincheck and try to make the effort the next time (or even set up another time for your coworkers to hang out on an evening that, say, your spouse will be handling daycare pickup). If you have an office, keep the door open. If you’re in a cube, try to resist the urge to wear headphones while you’re working. If you have an extra chair in your workspace, try to keep it clear of your personal belongings other than to show you are around. If there’s anyone you’ll need to talk to, consider sending them an email a day or two before to let them you’ll be in the office and available to them if they’d like to swing by your desk. It should go without saying to always keep your shared online calendar updated, but you might also want to consider having a physical schedule posted at your workspace with your office days clearly noted, and make sure it is up-to-date either personally or with the help of an office assistant. Be as clear as possible from the beginning and along the way with your supervisor as to whether “working remotely” means once a week, once a month, or only for very specific circumstances, such as a sick child or weather emergency when you absolutely can’t make it into the office that day. If you ever start to think your supervisor or coworkers are being resentful of you working remotely, such as leaving work for you on your desk on the days they know you aren’t in the office and not emailing you about it, or leaving you out of key decisions or projects because you aren’t at the office on specific days, have an in-person meeting with your supervisor to discuss how it’s going, ask what she expects of you on your remote days and office days, and have a frank conversation about whether she wants you to start coming into the office more frequently. The last part is especially true if working remotely was only meant to be a temporary arrangement. If you regularly work remotely or reduced hours, what are your tips on how to make the most of face time at the office? Do you have the same schedule every week to make it easier to schedule meetings and for colleagues to speak with you face-to-face? Do you have a way of keeping up with the office gossip so you’re not too out of the loop? Are there any small efforts you’ve made that have gone a long way to show you are still a team player, even if you’re not always physically there? Pictured: Deposit Photos / pressmaster.